Africa Program Manager Adaobi Egboka and Vance Center colleagues engaged in a range of activities related to the Power Africa Legal Fellows Program and pro bono representation work in Africa. Orrick Herrington & Sutcliffe hosted the Vance Center African Legal Fellows for a panel presentation to discuss the legal professions and business conditions in their countries, as well as their experiences working in New York City. Orrick partner Rajen Ranchhoojee moderated the event, posing questions on the power sector and foreign direct investment opportunities in Kenya, Nigeria, and South Africa. The audience of approximately 30 included Christopher Moore, Deputy Business Unit Leader of the firm’s Energy & Infrastructure Group. The African Legal Fellows, along with Egboka, attended a week-long briefing in Washington D.C. organized by the U.S. Department of Commerce Commercial Law Development Program, with support from the U.S. Agency for International Development, the coordinating agency for Power Africa, the Vance Center’s partner in the Power Africa Legal Fellows Program. The Power Africa Legal Fellows Belinda Ongong’a (Kenya), Lotanna Nwodo (Nigeria) and Ejemen Ofoman (Nigeria), and the African Legal Fellow Njabulo Holphe (South Africa) met technical and legal experts from various U.S. government agencies that collaborate on the Power Africa initiative in Sub-Saharan Africa. The briefing began with opening remarks by Power Africa Deputy Coordinator Matt Rees, Jonathan Ng and David Stonehill of Power Africa, Mohammed Badissy and Stephen Gardner from CLDP, and Egboka. Power Africa presentations focused on the initiative’s efforts to create an enabling environment in the Sub-Saharan African energy sector and success stories in countries like Zambia. Bassidy addressed “Energy Finance and Procurement in Energy Transactions in Africa” including foreign direct investment in the energy sector, settlement of energy disputes, and issues related to the termination of Power Purchase Agreements. Sebastian Deschler and others from Cross Boundary Group and representatives of the National Association of Regulatory Utility Commissioners presented on the perceived investment risks, transaction costs, and entry barriers in the African energy market. U.S. Trade and Development Agency officials explained how reverse trade missions, feasibility studies, and pilot projects enhance accountability for investments, and agency General Counsel Anna Skubikowski Aguilera and her team took the fellows through a project preparation and case study simulation session to mirror various transactions done by the agency. Similar discussions took place with the Overseas Private Investment Corporation which is in transition to the U.S. International Development Finance Corporation. 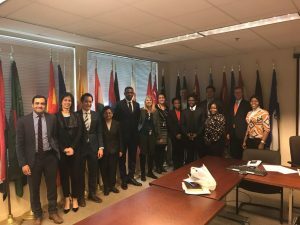 At the George Washington University Law School, the fellows attended a class on reviewing financial documents and participated in a program on sustainable energy initiatives. 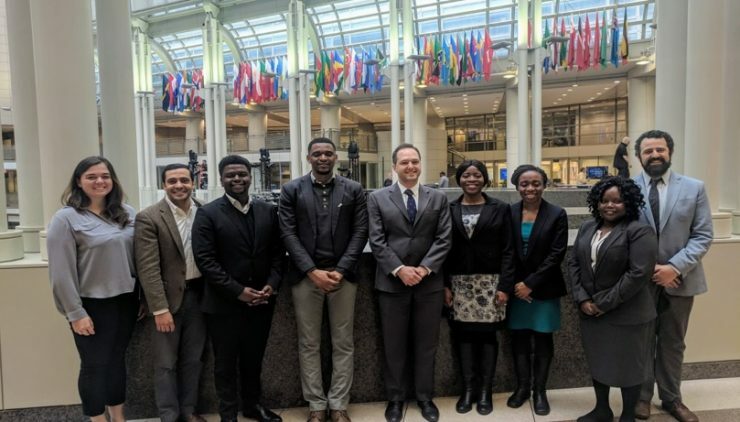 A team at Orrick Herrington & Sutcliffe, including Vance Center Committee member Lorraine McGowen, Washington, D.C. office leader Paul Zarnowiecki, Rajen Ranchhoojee, and Thomas Laryea presented to the fellows on the firm’s Africa practice and project finance work. Following the briefing, Egboka traveled to Kenya to explore opportunities and expand the Vance Center’s presence. She met with law firms already collaborating with the Vance Center, including Anjarwalla & Khanna, and established new relationships with law firms IKM Advocates, TripleOKLaw and Oraro & Company. She also met with Professor Kiarie Mwaura, Dean of the University of Nairobi, and Dr. Luis G. Franceschi, Dean of Strathmore Law School, to explore initiatives on clinical education in energy law to support the Vance Center’s and Power Africa’s shared mission to build capacity of lawyers in the energy and infrastructure sector in Sub-Saharan Africa, as well as pro bono practice. Ms. Egboka also participated in a brainstorming meeting organized by Human Rights Watch Kenya and presented the keynote message at a Learning Circle workshop organized by Amnesty International, Kenya to provide context on the Vance Center’s programs on public interest law in Africa. She also met the Executive Director of the Kenya Magistrates and Judges Association and the President and Executive Secretary of the Kenya Law Society to discuss Vance Center pro bono work, and agreed on possible collaboration. 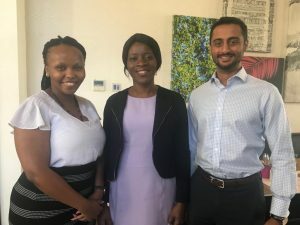 Adaobi also visited with the past African Legal Fellows from Kenya, Rosemary Maina of Bowmans Kenya and Naeem Hirani of Ajarwalla & Khanna, to discuss their post-fellowship activities in Kenya. Vance Center Executive Director Alexander Papachristou traveled to Ethiopia to offer lawyers and legal academics opportunities to collaborate with the Vance Center in the African Legal Fellows Program and the Pro Bono Representation Program. He met with law firms Mehrteab Leul & Associates, GeTS Law Office, Aman Assefa & Associates, Mesfin Tafesse & Associates, Tadesse Kiros Law Office, and Tamrat Assefa Liban & Associates. Representatives of Mekele, Haramaya, and Addis Ababa Universities presented to him their legal services and other programs. He also met the executive director and program officer of the Ethiopian Lawyers Association. U.S. Agency for International Development officials received him at the U.S. Embassy to discuss the Power Africa Legal Fellows Program, and he met several civil society representatives to discuss legal developments in Ethiopia and opportunities to collaborate with the Vance Center.